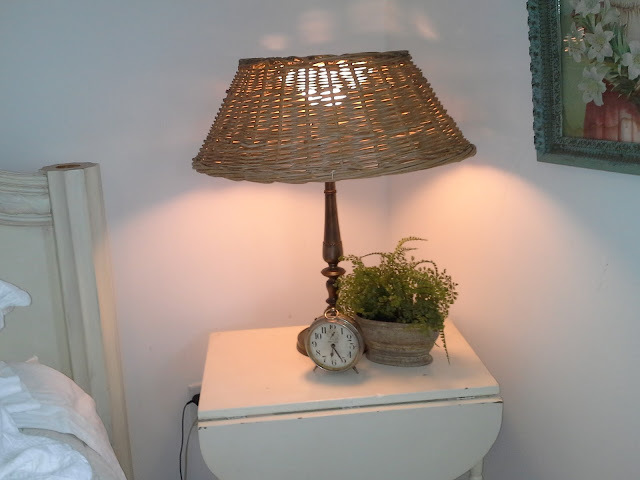 Lamp with upside down willow basket as shade. Have been busy this morning venturing into my next room to redecorate in the depot. I chose to do my bedroom. I moved the bed, exchanged a pie safe for a taller cabinet which will help a great deal when it comes to needing more storage for clothing. I also brang in my chippy white fireplace mantle which I love. So with one thing leading to another, I then began taking apart my old chippy white dresser. Took the mirror right off and placed it above, resting on the mantle. I then proceeded and with a brainstorming idea I might add, to place the dresser inside of opening of mantle.. Worked out great. So with everything in its place it was time for detailing. That took some time. You know, try this, try that for a few hours. Again with one thing leading to another, I had a lamp but was not crazy about the shadeso I had a cool idea....ready for this one? I had an old wicker basket that I turned upside down onto lamp and it really made a neat shade. At some point I would like to find a little bit more chubby lamp base. So that was my day. Now to get ready to attend my yoga class this evening. Oh, and pleavse pass the word about my blog. I have so much more to show and do and would really love more company here. I have at the right side of screen a place to click and enter your email address so that you will be notified of my latest and greatest postings as they happen. Would not want you to miss anything you know. Have agreat evening friends. Love, love, love it!! What a great idea on the lampshade! Thank you Dawn. I will share as fast as I can. Glad you enjoyed the posts! Hi Connie. So glad you stopped by. The shade did turn out nice. Even Ross liked it.